Outstanding antique mirrored back sideboard of grand proportions. This magnificent sideboard is of the highest quality in solid oak. A warm honey oak in colour gives it a a great orginal patina. Expertly carved, well fitted this is the work of amaster craftsman/cabinet maker. Main features include the grand carved original mirror, three large drawers, open dispaly section below drawers. Three carved doors to base fitted with more drawers and original cellarette. Provinence: This sideboard was originally from the estate of Mr Gordon Waterman of Victor Harbour, SA – a long established family in Adelaide with branches in the furniture trade and various other businesses. Mr Waterman was a keen collector of antiques. One of the finest examples of antique furniture we have had the pleasure of offering for sale. 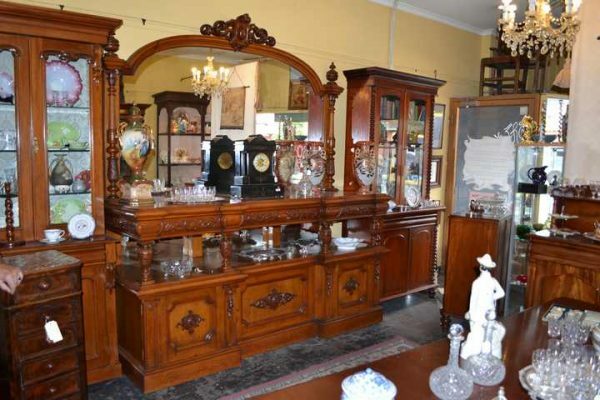 Welcome to Old Post Office Antiques with many examples of fine, good quality antique furniture at Melbourne’s best value for money antique shop.